The bedazzling Maang Tikas are worn by the Indian brides in their wedding. It is adorned at the temple, between the eyebrows which is said to protect the bride from bad energy. The tika represents the wisdom that a bride carries into her marriage. While the sparkling Jhumars are also embraced by many South Asian brides mainly Indians and Pakistani it not only looks exotic but it also adds that extra spark to complete the bridal look. 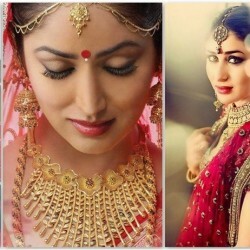 If you don’t know how to adorn these traditional wedding jewellery pieces, then check out some of the innovative ways in which you can wear the precious Maang Tikas and Jhumars on your wedding and shine out in glory.